The tomatoes are here! Tonight’s CSA share included basil, cucumbers, scallions and some truly glorious tomatoes. I had a wedge of red cabbage left over from the five-spice kale and cabbage slaw I made for a Fourth of July Party. And I has some feta–yet another great emergency protein source. Peel a few cucumbers, slice them up in half and scrape out the guts, which will make your salad too watery. Then dice them and add them to the bow. Add a couple of diced tomatoes. Some folks would have you de-seed these as well, but there was no way I was wasting any of that glorious tomato goodness. Add a few thinly sliced scallions and some basil chiffonade. Chiffonade is fancy chef speak for thinly sliced. I find the best technique is to stack the leaves (about 10 in this case), roll them into a spiral and then slice the whole stack. Crumble two or three ounces of feta and toss that in too. Drizzle with a tablespoon of good quality olive oil, a couple of tablespoons of red wine vinegar and some fresh-ground black pepper and toss it all together. You could toss some toasted whole wheat pita bits or some quinoa in if you’re looking for something a little more filling. If you are a patient person, you could let it sit for a bit so that the flavors meld. Alternately, you just could pour a glass of Vinho Verde and get to work. 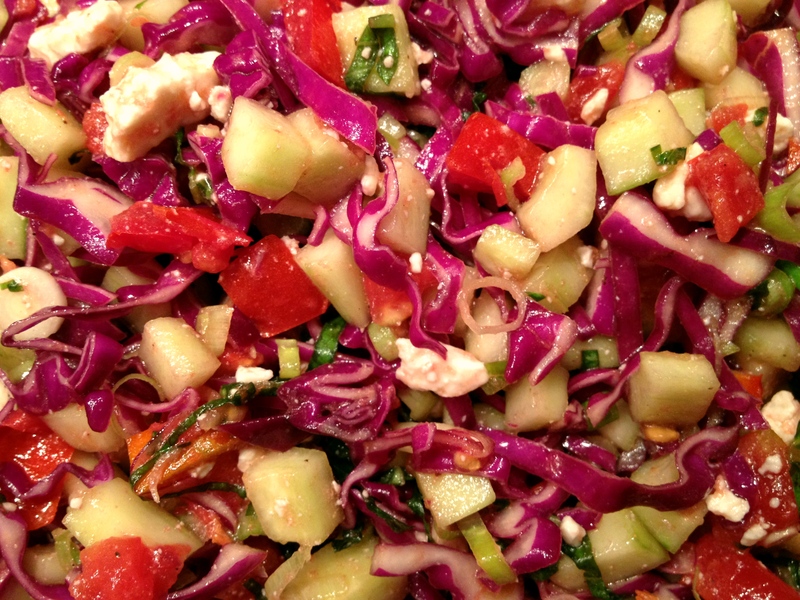 This entry was posted in quick lunch, salads, vegetarian and tagged basil, cabbage, cucumber, feta, scallions, tomatoes by Jasmine Nielsen. Bookmark the permalink.